Identify the type of tomato or pepper you are cultivating using the Panacea Tomato Cage Plant Markers. These adorable units add a fun hint to your tomato cage easily, while performing an important function. Each metal unit is shaped like a ripe tomato, with a rounded body and raised, leaf-like detailing at the top. Write your plant name on one of the included white tags, and insert it into the groove on the center of the marker. The top tab on the marker folds over your metal tomato cage, for an easy-to-find label. 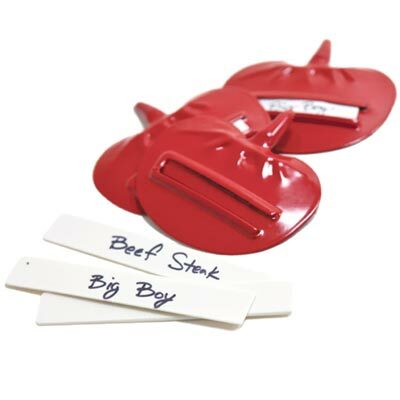 Made from metal, these markers will withstand use for many seasons, and the additional included white tags allow you to use the holder again and again. Label the different plants growing within your tomato cages with these Tomato Cage Plant Markers.